Here at Paperless Post, we aim to give you the perfect canvas and brushes for your creative ambitions—but we admit, sometimes you need something beyond the standard tools. Think of our Personal Design Services team as the Mod Squad for your invitations—but let’s get specific about what they can do for you. When in Rome, do as the Romans do. We may have taken that advice a little too far—our invitations tend to only use Roman characters. If you’re celebrating a religious event like a bar mitzvah or an Iftar dinner and need to incorporate letters from your language, don’t hesitate to contact us. We can put your lettering into the invitation’s wording, of course, but we also have plenty of time to illustrate and design your words of choice in the same style as the original greeting. Since we’ve had a lot of practice designing cards for our international audience of hosts, we keep a few stock blessings on hand, too, in case you need inspiration. 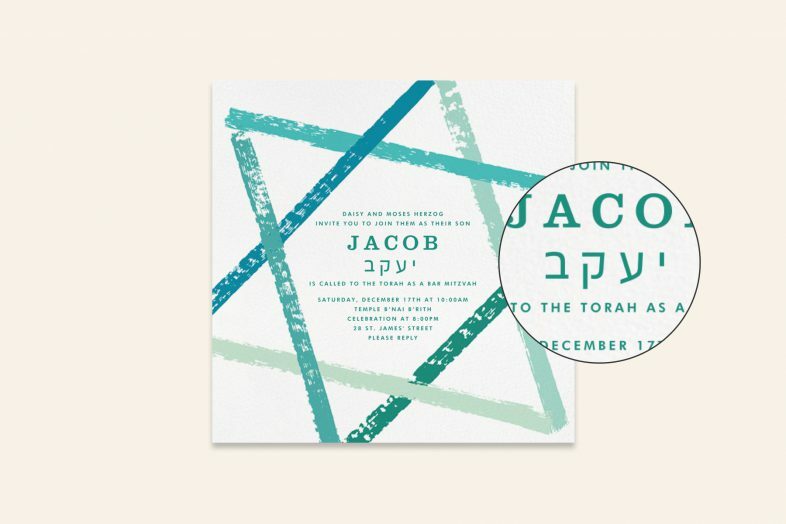 This invitation above is one we designed for a bar mitzvah—including type styling. A good party is truly universal. Sometimes our invitation’s “static copy” (those are the words you can’t edit in a design) needs a little reminding of that fact. Not to worry: if you love a design, but need to make the “Party” a “Fiesta” or wish your family a “Joyeux Noël” rather than a “Merry Christmas,” we’re more than capable of making the change. Here’s just a sample from one of the parties we’ve helped usher into new lands and languages. 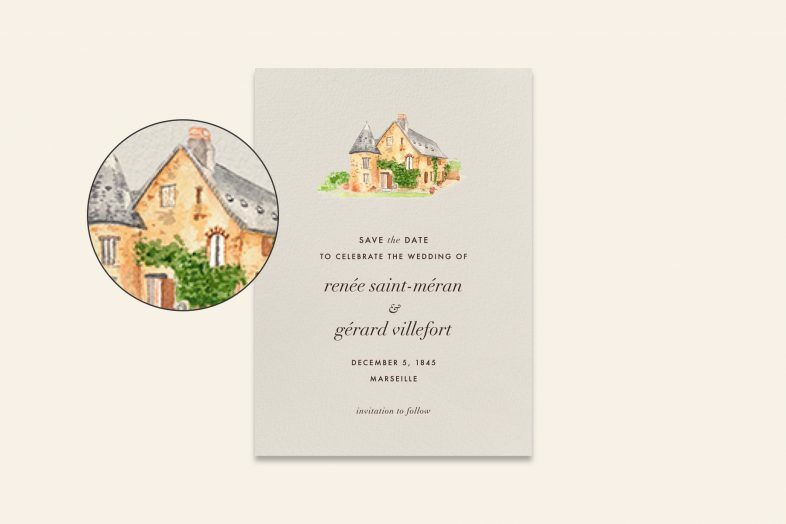 We changed the names to give the happy couple their privacy, but this little chateau is a very real wedding venue that our designers researched and painted from life. (Well, from photography.) In fact, this painting required a bit of research: the building was undergoing renovations between the design of the invitation and the date of the ceremony, and our designers worked with the venue’s owners to ensure that the illustration reflected the building on the big day. As with all things, life is truly in the details—and we’re well-equipped to handle them. Feeling inspired? 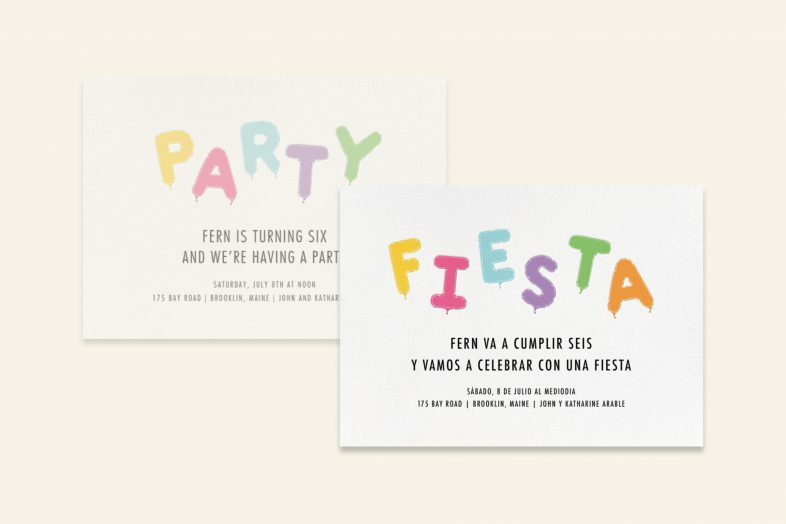 Contact our Personal Design Services team to start planning your next invitation, or browse some of our invitations for birthdays and general entertaining to get in the party mood.